Ask & ye shall receive! These are the eggs we made for Ben's end of the year preschool picnic. 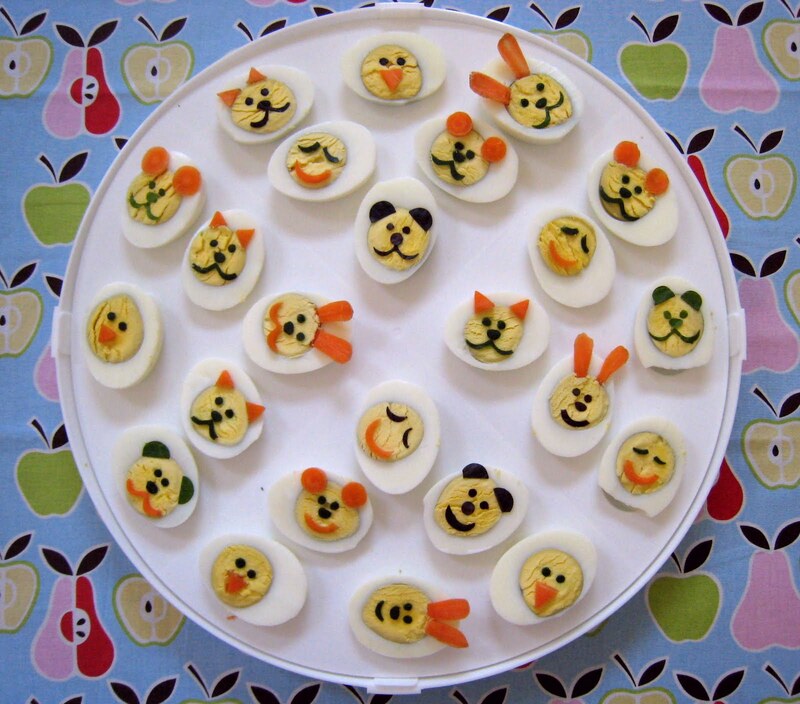 They are a great alternative for something cute if you don't have egg molds. A word of warning, they aren't complicated, but they are really not fun when you make 24 of them at once. 2 are fun. 24 is enough to make you stand in the kitchen cursing to yourself. We're making a bunny & a kitty today. From these two, it's pretty easy to see the bear, the duck, the mouse, or the sleeping kid. 2. 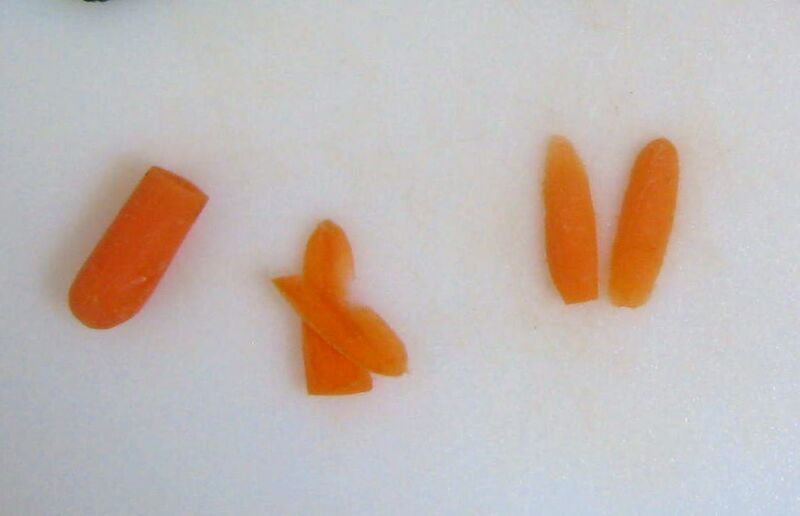 Starting with the thinner/smaller carrot, chop off one end to the desired bunny ear length. Shave off either side so you have two thin ears. 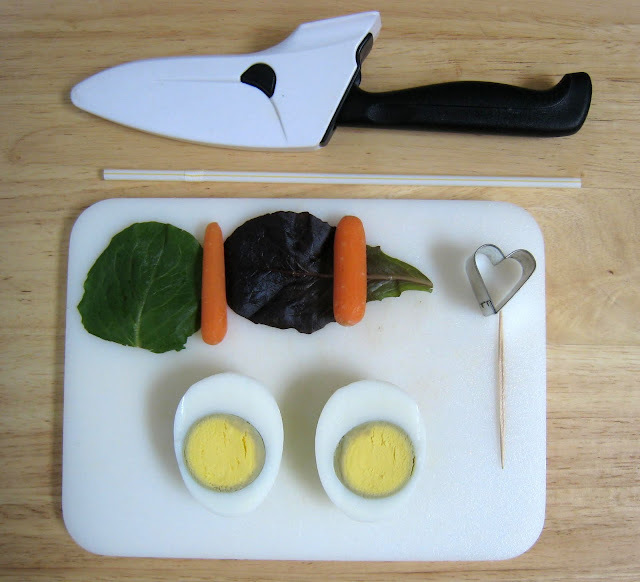 Use your knife to adjust the shape accordingly. 3. 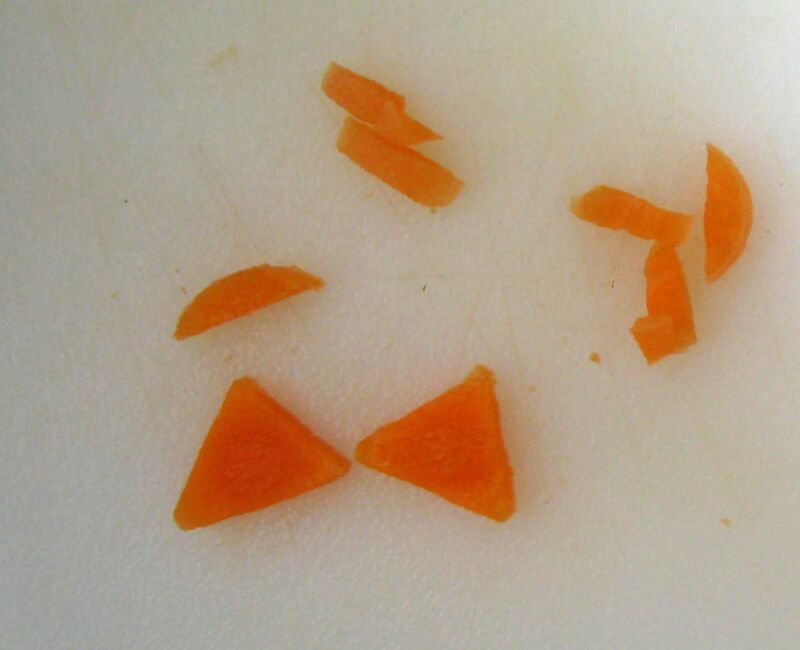 For the kitty ears, cut two rounds off the larger carrot, trim each into a triangle with your knife. 4. 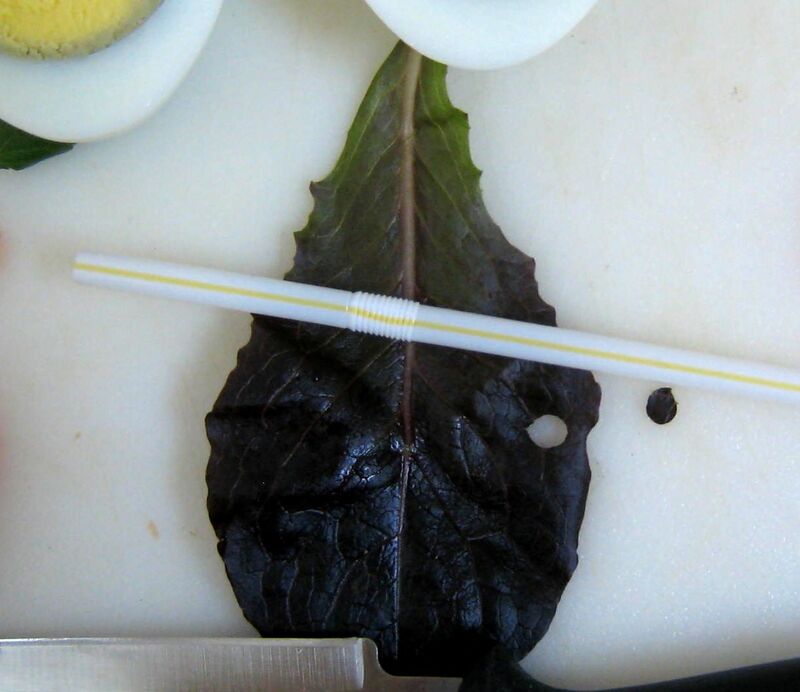 For eyes, hold down one of your leafy greens flat on the cutting board and slowly rotate the straw till it cuts through. You may need to poke it out gently with the toothpick if it doesn't cut smoothly. 5. Make some more eyes & noses. I needed 6 for this. 6. The mouths--Take the heart cookie cutter and cut out a heart/partial heart, making sure to get the whole scallop at the top. 7. 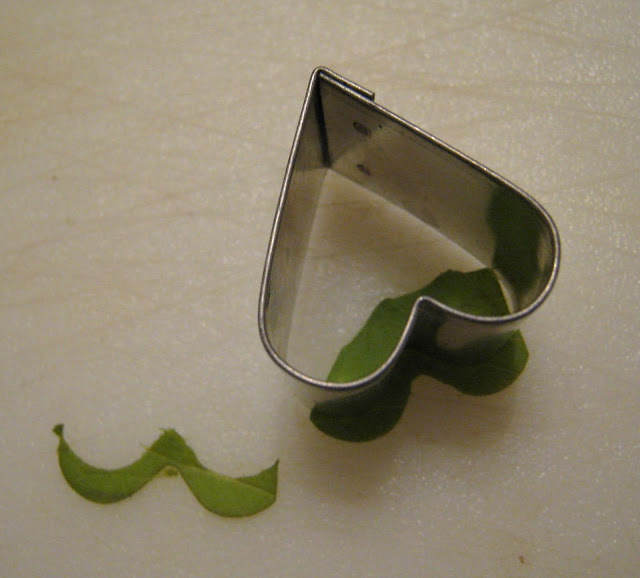 Move the cookie cutter back a fraction of an inch so you can see the top edge of the scallop and cut again. This should leave you a mustache looking piece. Make another one if you can or repeat 6 & 7 for the next one. 8. Time to assemble. 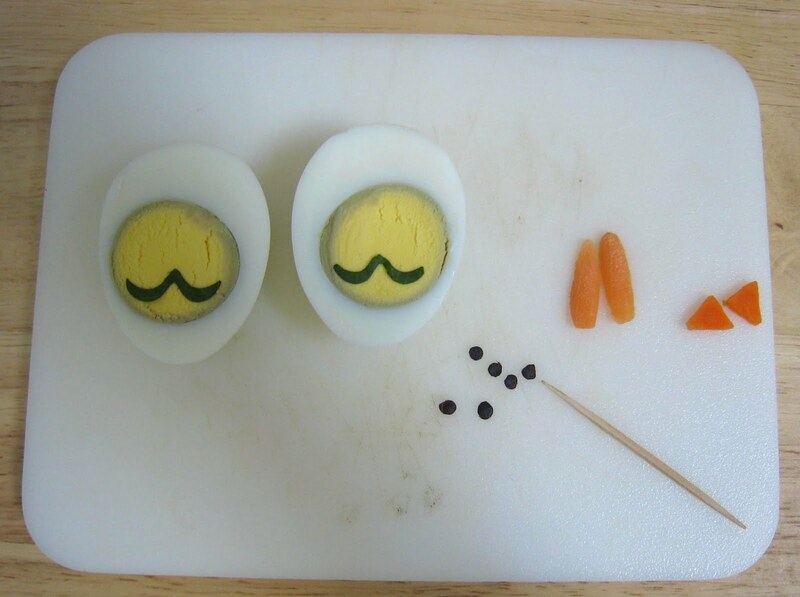 Gently lift the mouths onto the egg, move into place with the toothpick and lightly push them down to secure. 9. Same with the eyes. Move into place, then push gently so they stick also. 10. Ears! 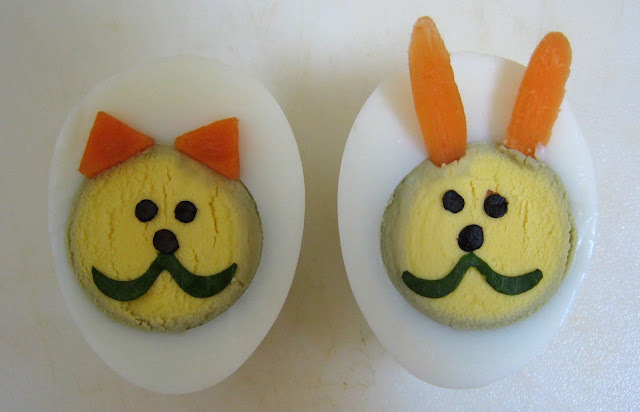 The kitty ears just kind of sit in place while the bunny ears are poked slightly into the yolk. Again, slowly slide these into place as not to mess up the rest of the face. 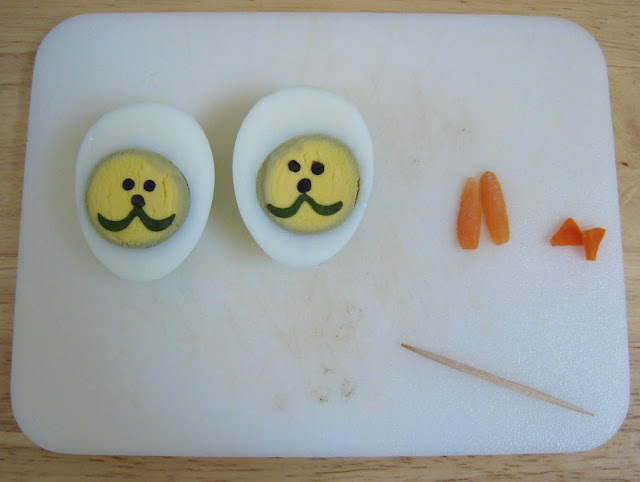 With Ben's preschool eggs, the sleeping face is the same mouth as the animals, but cut into eyes and a smile. The chick is the same eyes and a triangle kitty ear for the beak. The bear has carrot rounds cut in half for ears and the mouse has full carrot rounds for ears. Even better, no specialty items required other than the cookie cutter. Besides the Williams Sonoma set I always mention, craft stores typically have small cookie cutters in cute patterns (I also like Wilton fondant cutters for projects). Thanks for the tutorial! I cannot wait to try this! Awesome tut! 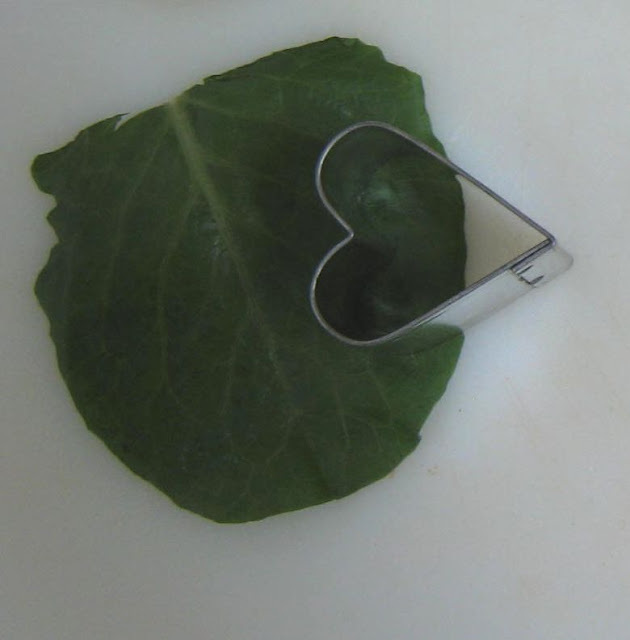 Love how you used the heart cutter to make the mouth, so creative! I was just thinking yesterday...I wonder how she makes those egg faces! It seems the universe took my thought across the wind to your brain. Wow. They look really cool. These are so cute, thanks for the tutorial! Thanks for the tutorial! It is great that most of us already have these items in our house and don't need anything special to make them. Why I did not think of that before?! Hey Shannon. 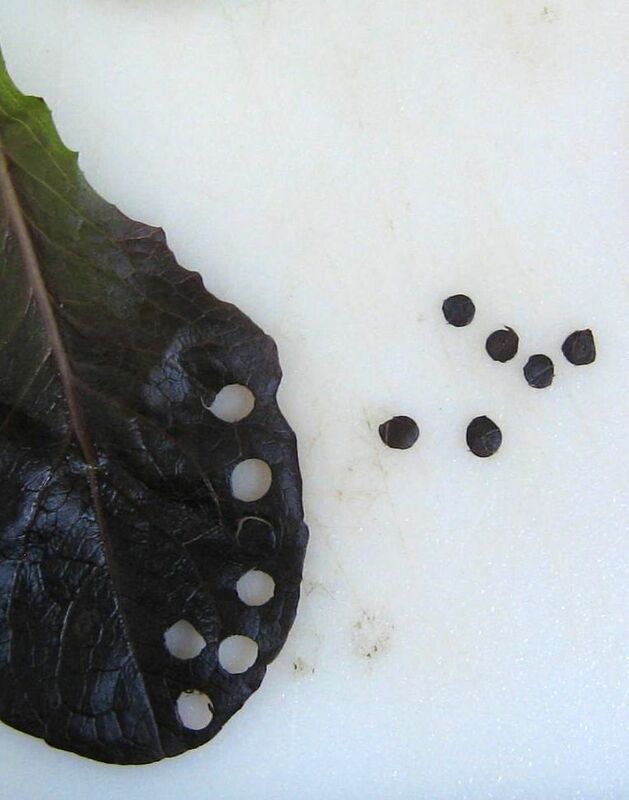 I have been thinking about this post of yours and the wonderful suggestion for using spinach/lettuce. I would love to do this as my daughter is not a fan of the nori that i use and keeps picking it off (don't blame her).This is the only idea i have come across that looks like it would make a great substitute but my problem is we just dont eat it often enough. Do you think you could cut the features out and freeze them? Have you ever tried this before?? Our Kroger has a salad bar, so I buy a leaf or two as needed. Does she eat cucumber by chance? I actually like teeny bit of cucumber peel better than the dark lettuce, it's a little sturdier to work with. Thank you for the tutorial! And for the add-on about using the cucumber instead of the dark lettuce - it's hard for us to buy just a couple of leaves, and cucumber is handy, I especially liked this because I'm not a big nori user, and have been floundering for another way to cut out facial features. originally cool :) you don't have to buy any fancy puncher, but you can do this also only with your cake-molder. i love it! So cute! i love it.